The Centre was named after Professor Bedwyr Lewis Jones in tribute to his life and his work. Bedwyr, as he was widely known, was Professor of Welsh at the University between 1974-92, and championed the use of the Welsh language in all the University's activities. Bedwyr was also a strong advocate of knowledge transfer - a long time before the term became fashionable - and placed great store on ensuring that his scholarship was shared beyond the confines of academia. He, more than anyone, through the radio programmes such as Yn ei Elfen and popular books such as Iaith Sir Fôn, Blas ar Iaith Llŷn ac Eifionydd and Enwau fostered the interest of ordinary people in the Welsh language. He was also a prolific lecturer at literary and other societies throughout Wales, and succeeded in making the Welsh language, its literature and letters a living, vibrant and fascinating entity. Developing and extending the use of Welsh within the University and among ordinary people and professionals is central to Canolfan Bedwyr's aims today. In this respect, we are Bedwyr’s heirs. Canolfan Bedwyr was officially opened in 1996 by his widow Mrs Eleri Wynne Jones, and in May 2010, she returned to unveil a bust that was commissioned in his honour. 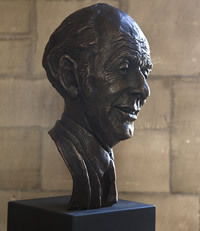 The bronze bust is the work of renowned sculpturor John Meirion Morris and can be seen outside the Council Chamber in the University's Main Building.